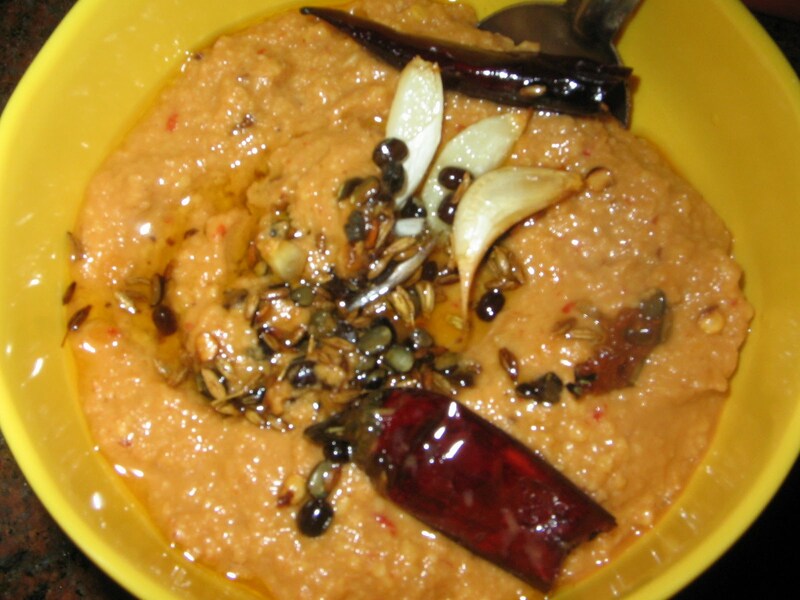 A favourites of andhras,kandi pappu pachhadi is a tasty variety .Rich in proteins turdaal can be had in this way also,and one can avoid eating plain daal daily,and this is a substitute ,it will be very tasty in hot rice with ghee. Dry roast turdaal in a pan,till it is medium brown in colour.Transfer it into another bowl,and wash 3 to 4 times after cooling,keep it aside.. In the meanwhile prepare seasoning, add 1 tbsp of oil in a pan and add urad daal,redchillies,jeera and garlic pods.Switch off the fire after it is done. Now place the the redchillies from the seasoning into a grinder,add tamarind to it and grind it,in to a paste,next add roasted and washed turdaal in to the grinder and ,grind it by adding water slowly in small quantities.It will require water to form into a paste,dont add whole water at a time.Lastly add a few garlic pods and salt mix and grind well.Remove in to a bowl and garnish with seasoning and a little bit of garlic and red chillies.It will be more tastier if this chutney if made in a big mortar and pestle (rubbu rolu). I learnt it from my friend Mrs.Indira gautam of Vizag.